Paris is the perfect place to spend a romantic weekend away with your loved one and when my boyfriend surprised me with a trip to Paris I went out of my mind. It was my first time in Paris and it was everything I hoped it would be! We stayed in the Montparnasse area in the center of Paris close to all the sights and attractions. The metro in Paris is the perfect way to travel from one place to another and you can even hop on a RER train from the center to Disneyland or other places to visit outside the city like Versailles. We had an amazing dinner at the Jules Verne restaurant on the Eiffel Tower which gave us an unforgettable view of the city by night. During the day I would definately recommend on of the many professional cooking classes around town. In three hours, 65 euros pp, we learned how to make traditional French macarons, yummy! Paris was great and I hope to spend another weekend there very soon. For all you lovers still heading there this summer, enjoy the good life! 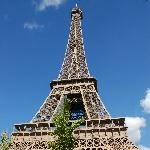 Did you enjoy Romantic weekend in Paris and have you been on a holiday in Paris, France?